Tom Bihn Ristretto: This isn’t the current version of the Ristretto, it’s an earlier iteration that’s designed to fit the 11-inch MacBook Air. I like it because of its sturdy construction and numerous pockets for all our gear. The newer Ristretto features a zippered front that helps prevent your stuff from spilling out. The one thing keeping me from upgrading is that Tom Bihn no longer offers it in the smaller size. Which is unfortunate, because this size makes a great iPad bag. Canon PowerShot G9 X: We bought this a few months ago, upon the recommendation of The Wirecutter. It’s a compact, lightweight camera with more features than we know what to do with. We were looking for something that was easy to use at the start, with more advanced features we could learn down the road. We wanted something that gave us photos that were better than those taken with our iPhones and the G9 X fit the bill perfectly without costing us an arm and a leg. 32GB SanDisk Extreme SDHC Card: This SD card was available for free alongside the G9 X when we ordered it earlier this year. Unfortunately, that deal is no longer available, but it’s still a great product. I’m sure there are better SD cards available, but I’ve been more than happy with this one. Tom Bihn Medium Clear Organizer Pouch: I like to keep my gear as organized as possible when I’m traveling and these zipper pouches from Tom Bihn are perfect. Their best feature is the little clip on the corner that can be used to secure the pouch to the inside of your bag. I left it attached the entire trip and only pulled it out of the Ristretto just enough to get the cables or adapters I needed without having to separate the two. Two Apple EarPods: While most of our friends have upgraded to fancier in-ear headphones, my wife and I have stuck with Apple’s white earbuds. I’m sure we’d be happier if we bought something else, but these work just fine. We find them comfortable to wear and the audio quality is perfectly acceptable given that we spend most of our time listening to podcasts with varying degrees of audio quality. Case Logic Ultra Compact Camera Case: I needed something to protect our camera from drops and prevent damage if it was jostled inside our bag. This was an inexpensive case that claimed to fit the G9 X and that’s exactly why I bought it. Lightning to SD Card Reader: While the 32GB SD card was more than enough storage for all the photos we took during our trip, I still wanted to offload images onto the iPad before we got home. That way we could view the images on a larger screen, edit, and share them throughout our trip. We could have used the Lightning to USB Camera Adapter, but this is a much cleaner solution. Canon Battery Charger: In hindsight, I don’t think I would have packed this item. We used our camera quite a bit and never ended up needing to charge it. But even if we did, the cameras in our iPhones would have sufficed. If we were going on a longer trip, maybe, but at just five days, it wasn’t necessary. Original TwelveSouth Compass and Sleeve: I bought this for my first-generation iPad several years ago and I continue to use it today. If I was in the market for one now, I’d probably purchase the Compass 2. Although, saving about $20 by buying the older model is also appealing. There isn’t that much difference between the two models and, in my experience, they last forever. iPad Air 2: Since I purchased this device 18 months ago, it has slowly taken over as my primary machine for nearly every task. I still have a Mac mini which serves as our backup target for iOS devices and hosts our iTunes and Photos libraries. But for all of my day-to-day work, this is what I use to get it done. I own the 64GB, Wi-Fi-only model in space gray. Although, I do have my eye on the iPad Pro lineup. I expect, when I eventually upgrade, I’ll purchase the newest 9.7-inch Pro with at least 128GB of storage. Tom Bihn Small Halcyon Organizer Pouch: All the features of the clear pouch, but with a punch of color rather than a translucent side. I use this one to house small adapters and cables. Anker PowerPort 4: I’ve written about this already, but the PowerPort 4 has just enough USB ports to charge all of my devices when I travel. Since I didn’t bring my Apple Watch, I could charge my iPhone, iPad, portable battery, and my wife’s iPhone from a single wall outlet. Anker Micro USB Cable: The one I have came with the PowerCore 13000 and is about two feet long. It doesn’t seem to be available separately, so I decided to link to a one-foot cable instead. The Anker battery is the only item in my bag that uses it and I’d rather have a shorter cable anyway. Apple USB Power Adapter: Like every person in the world, my wife prefers to charge her iPhone on her side of the bed. We have — what seems like — dozens of these laying around the house and they’re incredibly compact and perfect for traveling. Anker PowerCore 13000: Anker seems to have the market cornered on portable batteries. They’re inexpensive, well-built, and reliable. I bought this one specifically because it hit the sweet spot between size and capacity while also featuring two USB ports. In an ideal world, we’d never have to use this. But if anything happened to go wrong on our trip, this would be a godsend. Anker Battery Pouch: I could have listed this alongside the Anker battery — as I did with the Compass — because it comes in the box and isn’t available separately. But I don’t think I’ll be packing this again. It’s not made out of particularly good materials and it’s just unnecessary. It only holds the Anker battery and I already keep that in its own pocket inside the Ristretto. Three Apple Lightning to USB Cables: We brought two iPhones and an iPad, they have to get charged somehow. Like the Apple USB charger, we have dozens of these laying around the house and haven’t had any reason to buy new ones. I have my eye on the Night Cable by Native Union for use at home, but I’ll probably continue using Apple’s Lightning cables for travel until they don’t work any more. Herschel Supply Co. Anchor Sleeve: A very simple sleeve built out of quality materials. I’ve only had it a couple weeks and I’m already impressed by it. I don’t keep my iPad in a case, but if it took a tumble inside this sleeve, I have confidence that it would make it through unscathed. The Anchor sleeve comes in several colors — I considered getting it in black, to match most of my kit, but thought it would be wise to add a little color to my life. Tom Bihn Key Strap: This is usually just for keeping my keys from falling out of the bag, but we occasionally use it to keep oddball items that we pick up in the airport from getting lost. 3-Foot RadioShack HDMI Cable: We got this for free as part of a special deal when we ordered our fourth-generation Apple TV. There’s nothing special about it, but it works just fine for our needs. Lightning Digital AV Adapter: We hate cable television. And although we don’t spend too much time watching TV when we travel, we like to have it on for an hour or so before we fall asleep. This lets us connect our iPhones or iPad to the hotel TV and watch Hulu, Netflix, or YouTube, just as we do at home. 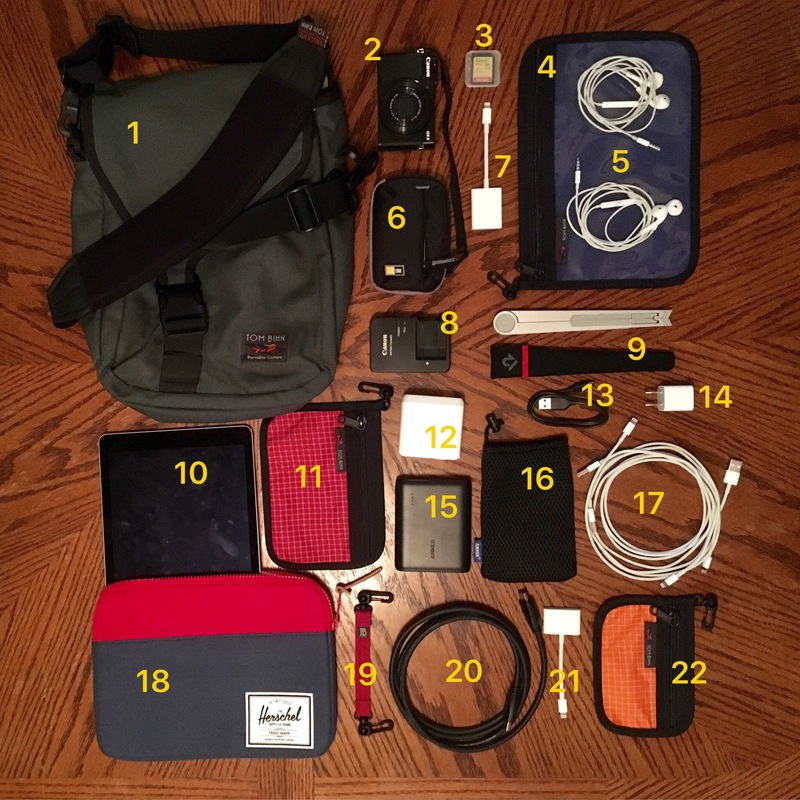 Tom Bihn Mini Halcyon Organizer Pouch: This was a last minute addition to our travel kit. I wanted a small zippered pouch that we could keep our headphones and a single Lightning cable in for quick access. I was more than happy with the small Halcyon Pouch we had bought previously and decided to buy another one in the “mini” size. It was just big enough to fit the items that we would need during travel while still being small enough to fit inside one of the pockets in the Ristretto’s front compartment. This setup worked well and there isn’t much I would change about it. I’ll probably drop the Anker battery pouch and, unless I’m going on a longer trip, I don’t think I’ll be packing the camera charger again. I would like to add a headphone splitter, though. On the plane, my wife and I ended up sharing a single pair of headphones because we wanted to listen to a podcast episode together. A headphone splitter would let us listen from a single device without accidentally pulling the earbud out of the other person’s ear. One last thing that’s worth pointing out: I didn’t bring my Apple Watch. My original packing list included my Watch charging cable and a couple extra bands, but I decided against bring it on this trip. Don’t get me wrong, I still wear my Watch everyday while at home, but I didn’t want yet another device to keep track of and worry about charging during our travels.